SAN FRANCISCO – San Francisco Japantown, one of three remaining Japantowns in the U.S., announced on May 29 a new logo and banner for its community, made possible through the generous funding by the Mayor’s Invest in Neighborhoods program and Mayor’s Office of Economic and Workforce Development. It was perfect timing, as the Japantown Cultural Heritage and Economic Sustainability Strategy (JCHESS) was adopted last year, that a new logo and banner that reflects a marketing recommendation in the JCHESS be created. 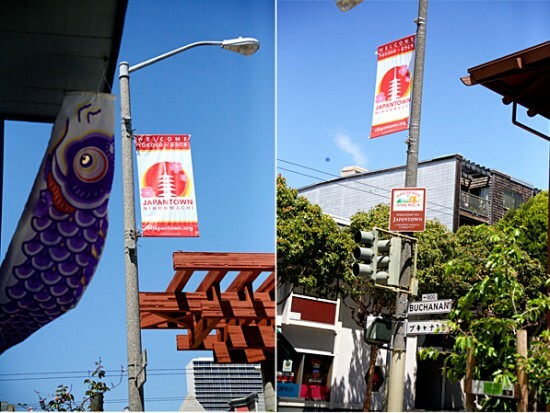 This rebranding effort was coordinated in cooperation with the Japantown Task Force (JTF) and the Japantown Merchants Association (JMA). The Request for Qualification process began in late 2013 when graphic designers were invited to come up with a new logo and theme. The final selection followed a series of meetings and eventual selection of the new logo by the JMA members. The basic design will be reflected on future S.F. Japantown promotional material. All businesses and organizations that operate within the borders of Japantown and are developing new marketing or informational material are encouraged to use the new community logo. The JMA is a non-profit organization that encourages business traffic within the Japantown area and provides a variety of services for business owners. It is a coalition of more than 90 businesses and community-based organizations. The JTF is a 501(c)3 non-profit corporation focused on the planning, economic development, and preservation of Japantown.